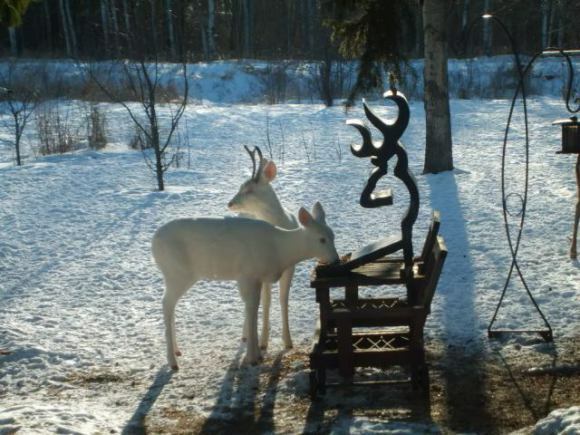 If one white deer is rare, the odds of a pair showing up are, well, odd to say the least. Unlikely or not, the pair of snow white deer spotted in a London, Ontario backyard brightened up one homeowner's morning and, if folk legends can believed, just may have brought him good luck. That's an understatement, as only about one in 10,000 deer are born pure white. According to Ben Hindmarsh, a fish and wildlife specialist with the Ontario (canada) Ministry of Natural Resources who studied photos of the deer taken by Baert, the deer were males and approximately one year old. It's likely they're twin brothers, and there aren't enough zeros available to calculate those odds. White deer occur as a result of two genetic conditions: albinism and leucism. Hindmarsh speculates the pair of young bucks were leucistic as their eyes weren't red. While albinos suffer from a complete lack of the pigment melanin, leucistic creatures are characterized by a reduction in all types of skin pigment. The pigmentation loss doesn't affect the eyes, however, as their pigmentation “programming” derives from a different set of genes.